Learn how to save, clean and store seeds for herbs and vegetables. Learn how to collect and save the seeds from herbs and vegetables in your garden. Choose the healthiest to grow more good food plants adapted to your particular location. Reduce plant diseases, increase food security and resilience. We will also be cleaning the seeds and package them for good storage life. 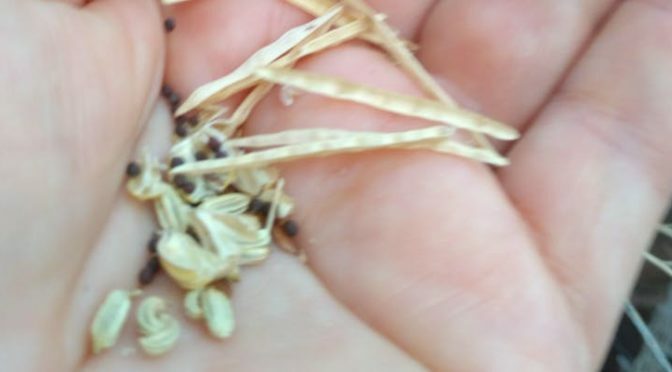 In this hands-on practical workshop you will learn how to save seeds from plants of several families, and leave with a few packets of seeds to plant in your garden. $5 per person or two tickets for a family. DEG members attend free. Are there minimum age requirements for the event? Children are welcome with an adult. Buy two tickets for a family. DEG financial members attend workshops free. You might choose to join DEG on the day. $15 for individuals $25 for a family gives you membership for the calendar year. Public transport can bring you from Warwick Train Station to a bus stop near the Library. Parking is available within easy walking distance. *Some people reuse window envelopes as seed packets. If you have any (maybe some your bills came in) you could bring and reuse them today. *Some people fold paper to make envelops to store seeds. Bring scrap A4 or A5 paper for reuse. *You are welcome to bring seeds you have saved from your garden or collected elsewhere. We might be able to help you identify some mysteries. There are 30 places available.